Luke Adams is the lead writer, manager, and editor for Hoops Rumors. Luke began writing for MLB Trade Rumors in September 2009, contributing hundreds of posts to MLBTR over the next two-plus years before becoming the full-time editor, manager, and lead writer for Hoops Rumors in January 2012. He helped to launch Pro Football Rumors in January 2014 before returning to Hoops Rumors in May 2016. A graduate of Western University, Luke currently resides in Toronto, Ontario. 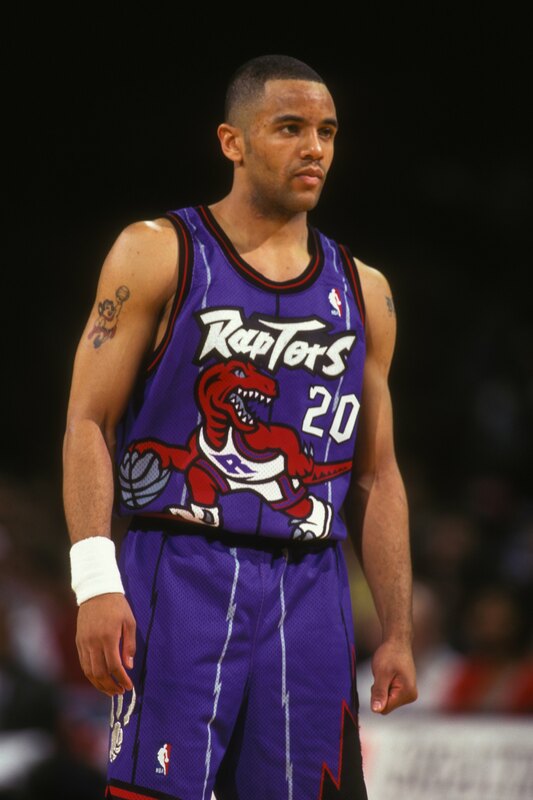 Luke’s NBA fandom began in earnest in 1995, around the time Damon Stoudamire became the first draft pick to wear the expansion Toronto Raptors’ truly awful jersey. Christopher Crouse is a staff writer and social media specialist for Hoops Rumors. He is a graduate of Temple University’s Fox School of Business and he currently resides in the Philadelphia area. This former mathlete supports the Sixers and probably attends too many home games during their “rebuilding” effort. Chris’ basketball career ended after high school, but he is often compared to Ricky Rubio in current-day pick-up games. His dream is to become the GM of an NBA team and if his multiple fantasy basketball and football championships are any indication of future success, Adam Silver will be handing his future team the Larry O’Brien trophy several times. Arthur Hill joined Hoops Rumors in 2014 as a staff writer. He is a newspaper editor with Trib Total Media in southwestern Pennsylvania and has been following basketball long enough to be a fan of both the NBA and ABA. He is a graduate of West Virginia University and covered Mountaineer basketball during the glory days of the Eastern Eight and Atlantic 10. His fondest memories as a player were scoring six points against a Harlem Globetrotters knock-off team and being dunked on by former NFL All-Pro linebacker Renaldo Turnbull. Dana Gauruder joined Hoops Rumors in February 2015 as a staff writer. He also writes for The Sports Xchange as its primary correspondent in Michigan, covering the Detroit Pistons, Detroit Lions, Detroit Tigers and Michigan State University football and basketball. He was also a Pistons correspondent for NBA.com for five seasons, covering all of their home games. From 1996-2009, Dana was a staff writer for the Oakland (Mich.) Press and was the paper’s Pistons and NBA beat reporter from the 1999-2000 season until he left the newspaper. He also covered Michigan State in 2011-12 for CBSSports.com Rapid Reports. Dana has covered a number of major sporting events, including the NBA Finals, the Eastern Conference Finals, the World Series, the Rose Bowl, the NCAA Tournament, the Stanley Cup playoffs and the Breeders Cup. Mark Suleymanov joined Hoops Rumors in May 2017 as a staff writer. He is a graduate of Brooklyn College, where he majored in journalism. Over the last five years, Mark has covered professional sports — primarily basketball and baseball — for publications such as Fansided, SB Nation, and Scout Media. From 2015-2017, he worked as a staff writer for GiveMeSport.com, covering the NBA postseason, the draft, and the Knicks/Nets. Growing up, Mark’s favorite player was Kobe Bryant, and he was surprised it took him only 50 shots to drop 60 points in his final game. Austin Kent joined Hoops Rumors in December 2016 as a staff writer. He has worked as a freelance NBA writer since 2005, covering everything from Canadian prep ball to J.R. Smith‘s tattoos for publications like SLAM, Yahoo! and Fansided. In 2008, he launched The Good Point, a credentialed long-form online magazine. In 2010 he dropped out of biomedicine to work for an offshore sportsbook. Austin lives in Southern Ontario but was raised in the North where the Pistons still reign supreme. In 2013, The Good Point acquired Sports.ws, the advanced fantasy basketball platform of which he remains the lead administrator and editor-in-chief. He owns multiple Darko Milicic jerseys. Clark Crum joined Hoops Rumors in October 2017 as a staff writer. He is a graduate of Virginia Polytechnic Institute and State University, more colloquially known as Virginia Tech, where he played football and studied business before heading home to Columbus, Ohio to attend law school. Despite playing football in college, basketball has always been his first love, and he somehow managed to score over 1,000 points in high school despite carrying around the frame of an offensive tackle during his senior year. Growing up in Ohio in the early 2000s, Clark maintains a strong affinity for all things LeBron James, and feels that Dan Gilbert should continually be apologizing to The King for his infamous Comic Sans tantrum. JD Shaw joined Hoops Rumors as a staff writer in August 2018. He grew up as a Hoops Rumors reader and began covering the NBA for Def Pen, a Brooklyn-based online lifestyle magazine, in 2016. He has interviewed several NBA players, coaches, and agents for the company, written hundreds of news stories, and helped manage a basketball branch that includes nearly 30 staff members. JD lives in Branford, Connecticut and works at the Soundview Family YMCA in town, where he teaches sports and works with kids of all ages. Hoops Rumors is a clearinghouse for relevant, legitimate NBA rumors. The site focuses on trades and free agent signings. Rumors come from established journalists, and always include a link to the source material. All 30 teams are covered. Luke Adams, the site’s head writer, is supported by a full team of NBA fanatics. Hoops Rumors has new material 365 days a year, and attempts to post all rumors with analysis as soon as they are available. The site was created by Tim Dierkes in 2012, following the model of his successful MLB Trade Rumors.